This alley stretching between N. Astor and N. State Streets is a rare Chicago example of a roadway paved with wood blocks, and it exemplifies efforts in the late nineteenth and early twentieth centuries to find economical and reliable paving methods for hard-used city streets and alleys. In the early years after Chicago’s founding in 1833, the city’s residents endured muddy streets that made passage almost impossible and created a nagging nuisance. In response, city officials raised street grades and tried a variety of paving materials, including wood planks, brick limestone and granite, macadam and wood blocks. Chicago fire of that year, city officials continued using wood blocks to pave streets and alleys, including this one, into the early twentieth century. This alley was originally paved in 1909 by subcontractor Alexander Todd (working for the KRQ company). Cedar blocks treated with creosote were used, and it was one of only eight alleys paved that year with such blocks. In 2011, the alley was restored with black locust wood blocks from Pennsylvania. This restoration was made possible by the Department of Transportation: Historic Preservation Division, Department of Housing and Economic Development; Alderman VI Daley, and the Gold Coast Neighborhood Association. 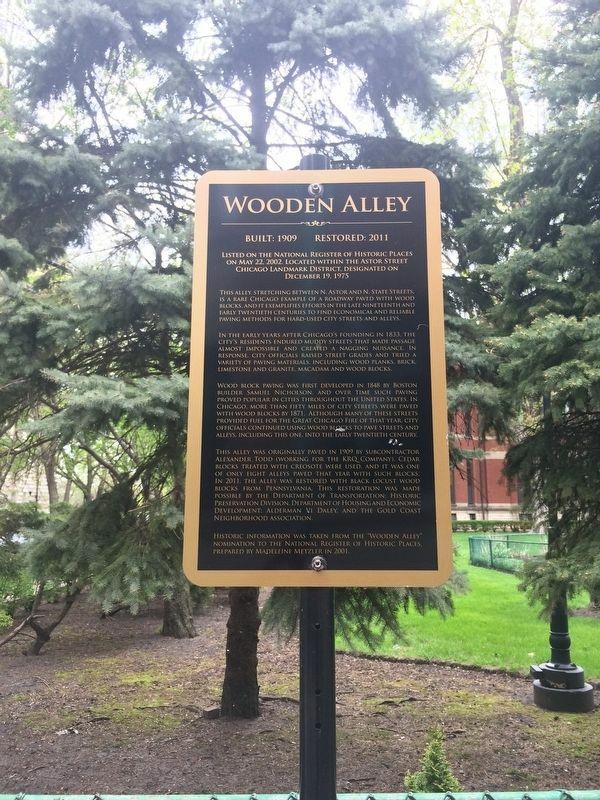 Historic Information Was Taken From the "Wooden Alley" nomination to The National Register Of Historic Places. Prepared By Madeleine Metzler In 2001. Erected 2001 by The Astor Street Chicago Landmark District. Location. 41° 54.61′ N, 87° 37.725′ W. Marker is in Chicago, Illinois, in Cook County. Marker is at the intersection of Wooden Alley and N. State Parkway on Wooden Alley. Touch for map. Marker is in this post office area: Chicago IL 60610, United States of America. Touch for directions. Other nearby markers. At least 8 other markers are within walking distance of this marker. Patterson-McCormick Mansion (about 300 feet away, measured in a direct line); Catholic Cemetery (about 500 feet away); Abraham Lincoln Monument (approx. 0.2 miles away); Couch Tomb (approx. ¼ mile away); a different marker also named Couch Tomb (approx. ¼ mile away); Potter's Field (approx. ¼ mile away); Churchill Corner (approx. 0.3 miles away); Early Prominent Residents of Old Town (#2) (approx. 0.3 miles away). 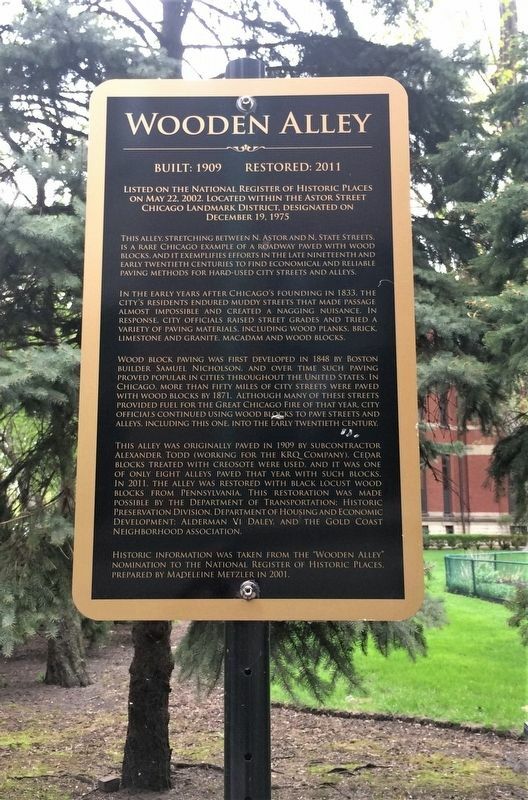 Touch for a list and map of all markers in Chicago. More. Search the internet for Wooden Alley. Credits. This page was last revised on April 13, 2019. This page originally submitted on April 13, 2019, by Steve Masler of Memphis, Tennessee. This page has been viewed 62 times since then. Photos: 1, 2. submitted on April 13, 2019, by Steve Masler of Memphis, Tennessee. • Andrew Ruppenstein was the editor who published this page.